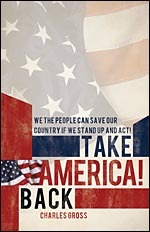 I have re-published The Danger of Progressive Liberalism with a new cover and title, Take America Back! The text is the same in both books. I have a few copies left of The Danger of Progressive Liberalism, which are discounted to $10.00 for the soft cover and $20 for the hard copy (scroll down for that option). Please choose whichever title you prefer and send me a message on my Contact link if you'd like your copy signed.